Your New Favorite Taco Toppings! TACOS. Let’s taco ‘bout em. HAHA. I love that little pun. There is a video floating around the internet, where I first heard this joke, that has hilariously been named “Two Chips” An animated Short. Its actually a 30 second video with the lead in…”My wife drank a bottle of wine then wanted to tell me a joke”. It’s freaking amazing and so funny and this will tell you a lot about my sense of humor so I hope you stick around after watching! Also the whole “my wife drank a bottle of wine then wanted to tell me a joke” really resonates with me (and my husband). Anyway after you watch the little video come back here and we’ll chat about YOUR NEW FAVORITE TACO TOPPINGS. These two recipes will bring ANY taco recipe to the next level. I promise you. 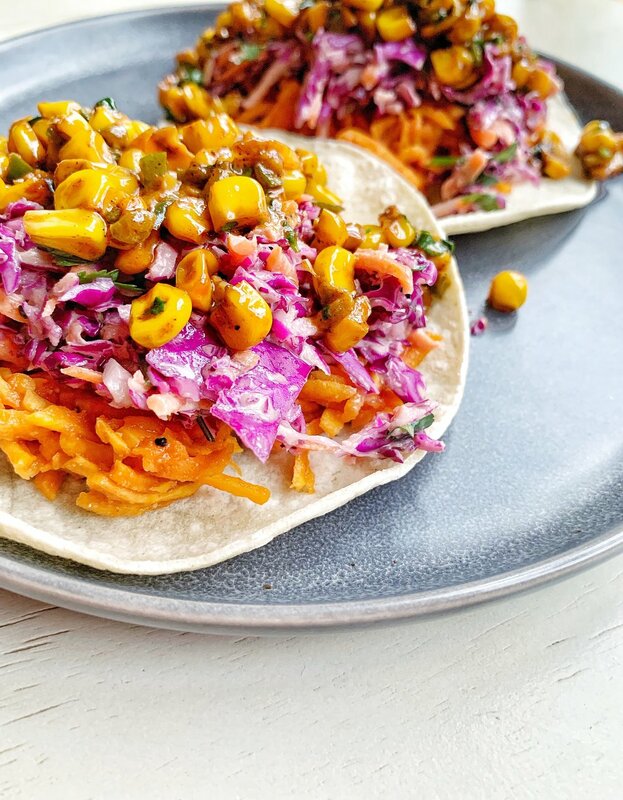 They would be perfect for a dinner or potluck where you are accommodating meat-eaters and herbivores alike, or just for your average Taco Tuesday! My husband likes to tease me when we eat tacos or nachos because I prefer a lot of crunch! Growing up we had tacos weekly and we ALWAYS, without fail, shredded a giant head of iceburg lettuce to layer onto our tacos and I loved it. So to this day my tacos have to have something crunchy and refreshing. Sometimes that’s a bunch of romaine-which my hubs likes to refer to as a “salad on my taco”—or sometimes it is a delicious and creamy and tangy slaw like this one! This is SO freaking easy and it is so so good. The best thing about it is that if you prep it a few hours or even a day ahead of time it just keeps getting better and better. 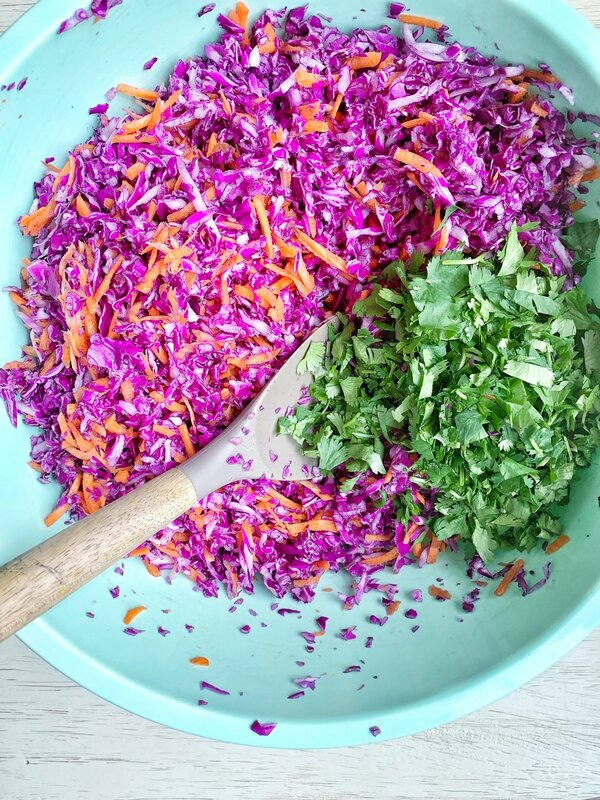 The cabbage gets soaked in the dressing and everything gets bright pink and beautiful and all the flavors marinate together to create the most incredible bite! I could eat this all by itself, it’s that good! And don’t stop at tacos! Add this to your burgers or with BBQ! I’ve paired this with so many dishes-it’s so versatile! Tangy, Spicy, Fresh! Add to tacos, bowls, burgers, and more! Cook time: No cooking necessary! Optional: Diced jalapeno for an extra kick! Whisk your dressing ingredients in a separate bowl and then toss all ingredients together. Top on burgers, tacos, in bowls…this is great in SO many dishes! Once the slaw is done-which takes less than 10 minutes if you use a shredder attachment on your food processor—go ahead and whip up a batch of this Mexican Street Corn! The spicy sweet little bite paired with a smoky taco filling of say sweet potatoes or lentils or cauliflower is KILLER. I first tried a similar recipe to this a few years ago at a cookout and we appropriately titled this dish “crack corn” because you CANNOT STOP EATING IT. Make sure when you make it you have extra tortilla chips to dip because no corn kernal will be left uneaten. I love to add a jalpeno and keep the seeds and ribs for an extra spicy bite-but feel free to take the seeds and ribs out for a more mild flavor or leave the pepper out all together. A few things I recommend you do not skimp on: the chili powder, fresh lime juice and handful(s) of cilantro. The creaminess factor is brought to you by vegan mayo and it just brings it all together at the end. 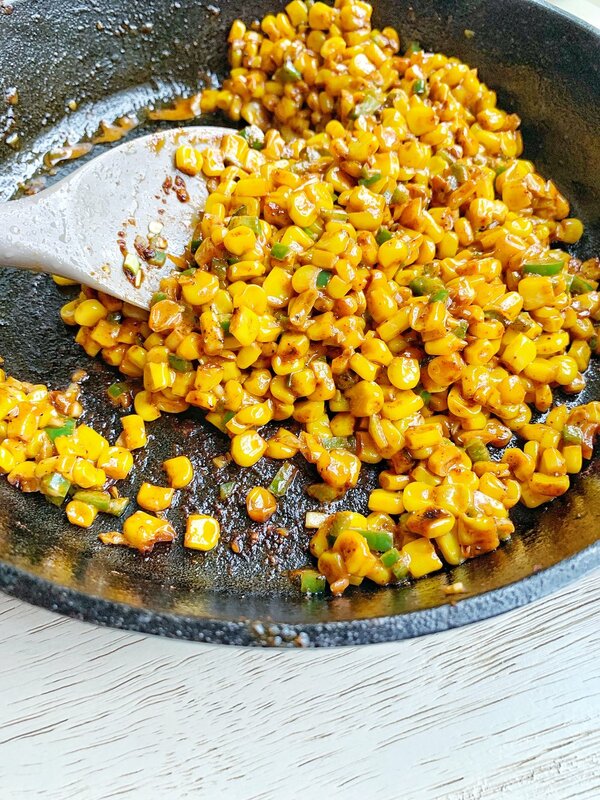 It’s best to let the corn get nice and charred in your skillet before adding all the other ingredients so it may take about 7-8 minutes of watching the pan, waiting to get some brown spots on your corn but it is worth it! Then you add your garlic, jalapeno, chili powder, salt and pepper and let all those flavors get to know each other for another couple of minutes. Finally your going to stir in your vegan mayo. Take it off the heat and add your lime juice and cilantro and you are good to go! Creamy and perfectly sweet-you won’t be able to stop eating it! Turn off the heat and add your vegan mayo, lime juice and cilantro. Add salt and pepper to taste! Health(ier) Brownie Batter for 1!